Nonadiabatic dynamics simulation of electronically-excited states has been a research area of fundamental importance, providing support for spectroscopy, explaining photoinduced processes, and predicting new phenomena in a variety of specialties, from basic physical-chemistry, through molecular biology, to materials engineering. The demands in the field, however, are quickly growing, and the development of surface hopping based on density functional theory (SH/DFT) has been a major advance in the field. 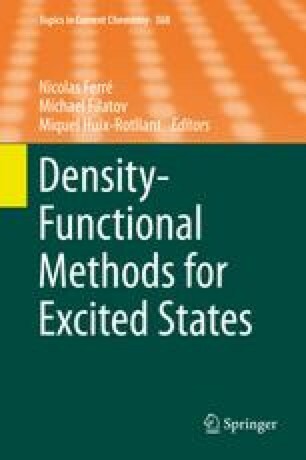 In this contribution, the surface hopping approach, the methods for computation of excited states based on DFT, the connection between these methodologies, and their diverse implementations are reviewed. The shortcomings of the methods are critically addressed and a number of case studies from diverse fields are surveyed. We would like to thank Dr. Michael Filatov for kindly providing the REKS data for Fig. 3 and also Dr. W. Arbelo-González, Dr. Fazzi, Dr. G. Rodrigues, and Dr. T. Very for helpful discussions.